Major advances were made by rebels in the last couple of weeks. A claim made by Kiev that Ukraine recaptured the airport in Donetsk is a now proven lie. And the lies pile up. For example, on January 21, the BBC quoted President Petro Poroshenko "Russia has more than 9,000 soldiers and 500 tanks, heavy artillery and armoured personnel carriers in Eastern Ukraine". How can you hide 500 tanks and heavy artillery from US spy satellites? The answer is you cannot. And if those vehicles were actually in Eastern Ukraine, the US would have complained about it long ago. On January 19, the Russian Activist reported 382 Russian soldiers killed in Ukraine during last three days. "Respected Russian human rights activist Elena Vasilieva has announced that 382 Russian soldiers have been killed in Ukraine during the last three days." There were no pictures or names. The above sentence was the entire article. There could be as many as 15,000 Russian troops in Ukraine, many of them deployed there without official documents", said Valentina Melnikova, head of the Committee of Soldiers' Mothers. There have been a large number of these "Russian soldiers killed in Ukraine" stories in the Western press since last spring or summer. As a whole, they tend to confuse Russian soldiers with any and all Russians killed in Ukraine. Yes, there have been a lot of Russians, Cossacks, and Chechens who have crossed the border to join the rebel militia. Several hundred of them have been killed, and in most cases, their bodies have been shipped back, funerals held, etc. That does not mean that they were serving with the Russian army at the time of death. What's really confusing to the Western press, is that the Russian groups keeping track of the deaths include all Russian citizens killed in Ukraine in their tallies. As for actual Russian military deaths in Ukraine, it seems there were maybe several dozen of those, mostly from last August. But it was nowhere near the "thousands of Russians and hundreds of Russians tanks" claimed by Kiev. President Petro Poroshenko's claims are out-of-this-world nonsense. Valentina Melnikova is totally off her rocker. Her group lost all credibility back in the early 2000s, when it inflated Russian deaths in Chechnya by a factor of three or four. The allegedly widely respected Elena Vasilieva has claimed that entire Russian brigades have been wiped out in Ukraine. Keep in mind that a brigade is at least 2000 men. Of course, if 2000 bodies came back to one Russian base (or simply disappeared from one base), it would be all over social media in a split second. The western press has broadcast her claims with no questions and no sanity check. It is a disgrace. The Telegraph, the Washington Post, the Daily Mail, and even respectable places like The Guardian have all carried such stories. Lies repeated often enough get believed. That does not mean I believe everything Putin has to say. I surely don't. Both sides lie. The first casualty of war is the truth. But the preponderance of easily disputed lies is from Kiev. Yet, few in western media are willing to call President Poroshenko on them. Looking for accurate reporting of Ukrainian dead soldiers? Don't expect that out of Kiev either. CounterPunch explains in Ukraine’s Lower Class Military. Recently, there appeared on the Internet an electronic database with photo-documents of Ukrainian military personnel killed in the war in eastern Ukraine. The documents include passports, military IDs, drivers’ licenses, personal files and credit cards. Some papers are half-burned, while others are untouched, as if nothing has happened to their owners. The documents were found with the dead bodies of these people in several areas of the Donbass region of eastern Ukraine, near the towns of Saurovka and Illovaisk, close to the cities of Donetsk, Lugansk and Gorlovka. The papers were published at the suggestion of the search teams so that the relatives of those killed could finally find out about their fate of their loved ones. As it happened, the majority were still officially listed as missing. They were also not included in the statistics of losses of the Ukrainian army. The dead soldiers are from the 30th Mechanized Brigade of the Ukrainian armed forces, which in August was sent by its command into a crazy, suicidal mission. The brigade was ordered to attempt a breakthrough that could lead to capturing the cities of Lugansk and Donetsk by the time of Independence Day in Ukraine, August 24. In scanning the scanned papers of the dead soldiers, one can clearly see a social portrait of the soldiers of the Ukrainian army. It is ordinary people who were killed on the soil of Donbass. Soldiers and junior officers were mostly from peasant backgrounds. We are often told that everyone is equal in death, but as we clearly see in this example, this is not the case. President Poroshenko, who is directly responsible for the catastrophic losses of the Ukrainian army and the death of civilians in Donbass, hypocritically mourns killed journalists in Paris on January 11 while in Donetsk, innocent people continue to die. Children of Ukrainian politicians and oligarchs are not lying dead in the lands of Donbass. They enjoy a life full of fun and joy. They don’t fear forced military conscription. The petty, provincial bourgeoisie can relax and pay a bribe so their sons will not be drafted into the army. The corrupt generals cover for such ‘business as usual’. 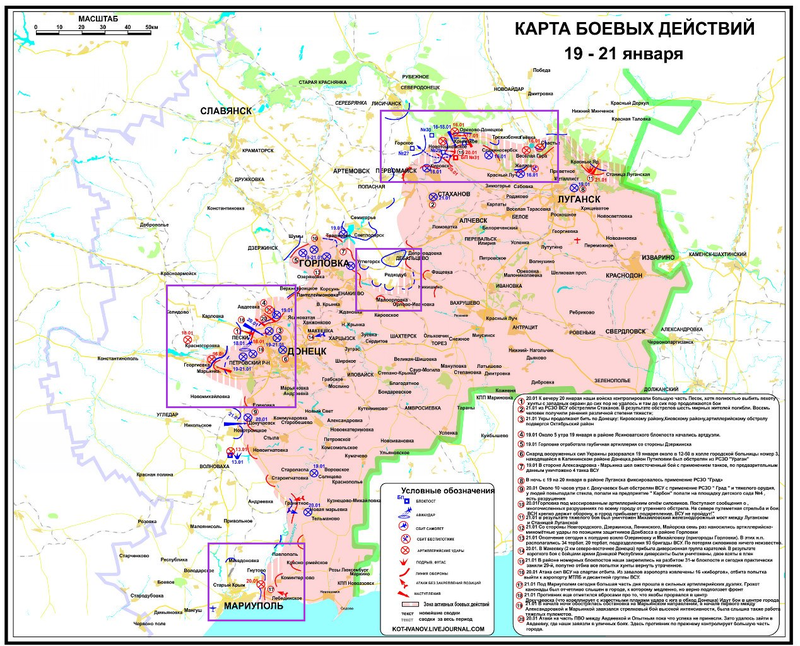 Let's step through a succession of maps, from August 2014, from September 2014, and one from the last two days. On August 26, I also posted Jane's Defense vs. Colonel Cassad: Someone Seriously Wrong. Jane's Defense had made the claim Ukrainian Military Moves to Endgame. My sources accurately challenged that claim. The above from September 3: Ceasefire or Not? 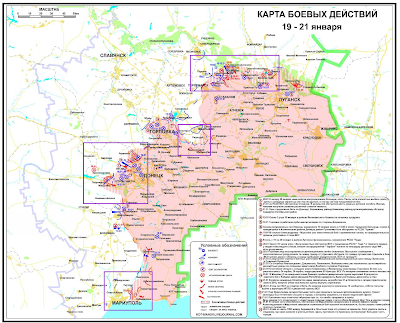 Note that many white areas on the previous maps are now pink (totally in rebel control). 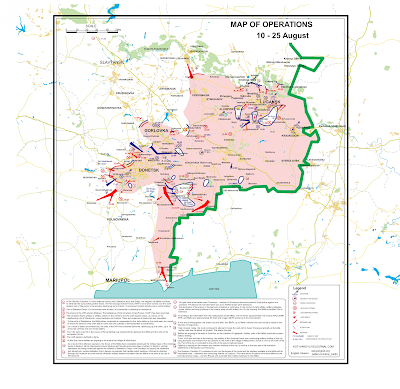 The hashed pink areas are recent rebel advancements (neither side controls completely). In the South note the march on Mariupol. Here is a video of Ben Hodges, U.S. commanding general of NATO ground forces, visiting wounded/crippled Ukrainian soldiers in the hospital and giving them cheap little trinkets/mementos. Some of it is in English. Link if video does not play: Ben Hodges Visits Troops. This is what it boils down to ... Get drafted, lose an arm (or die), get a NATO trinket worth about $2. One of the leading rebel sources claims that the operation to close the Debaltsevo "pocket" has begun. If closed from its northern-most edge, this would trap as many as 15,000 Ukrainian soldiers and militia as well as some of Kiev's heaviest artillery. Also, one or more Ukrainian mortar shells landed next to some kind of bus or trolley in Donetsk this morning. The footage looks pretty bad. At least 8 civilians were killed, 7 of them inside that vehicle, and another 13 are in the hospital. "They are all Charlie", I'm sure. Massive Ukrainian shelling of Gorlovka continues. Over 100 civilians have been reported killed there since the weekend. "A convoy of rebel towed antitank guns was shelled by Ukranian artillery near the town of Adveevka west of Donetsk airport, with 30-40 estimated dead and wounded. With a figure that high, it means all of the equipment was destroyed as well. 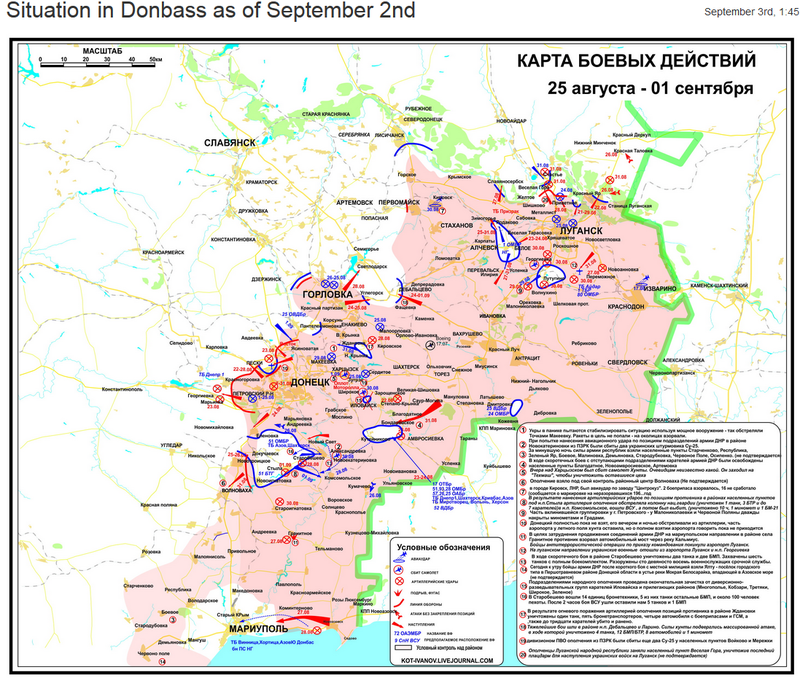 Colonel Cassad makes the point that the rebels actually report their losses, whereas the Ukrainians don't." 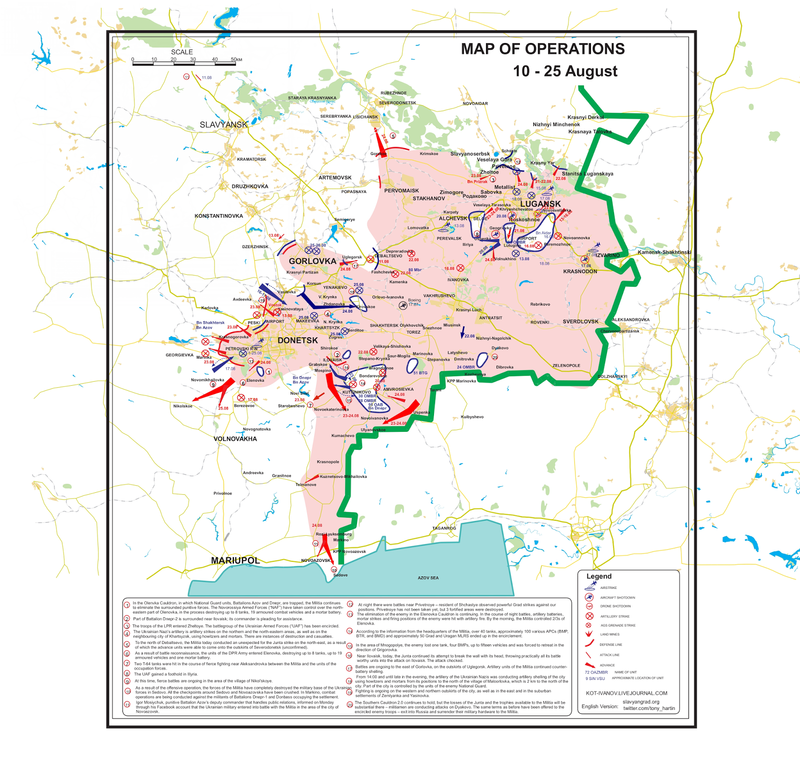 Dreizin had also reported that supply lines to Mariupol have been cut. A key bridge far west of the city in Ukraine-held territory has been blown up. Interfax-Ukraine claims Train Movement on Damaged Bridge to Mariupol Restored. NATO and the US seriously underestimated the lengths Russia would go to stop the march of NATO eastward. I have to wonder, how much longer Mariupol will last. Did Ukraine spread itself too thin trying to capture the Donetsk airport? I think so. And for what? Symbolism? The entire war is nothing but a sad war for symbolism. Ukraine was never really one united country in the first place. Politicians create these messes by failure to take political, cultural, and religious differences into consideration when they draw maps.